I love drinking Port. I first starting drinking it at the last hockey match before christmas, in the in-goal half time team talk. To be fair, that was probably the old supermarket’s value own brand, but luckily over the years I’ve managed to try lots of different examples, and I’ve really loved them. If you’ve never had port, the styles do tend to vary a bit, but roughly speaking (the ones i’ve had anyway) are really fruity, spicy, and a hint of sweetness throughout. The jammy fruit comes from grapes on the roasting hot slopes of the spectacularly beautiful Duoro valley, the river which hits the Atlantic in the city of Porto, where the drink gets its name from. And there’s lots of different grapes that go into the blends. 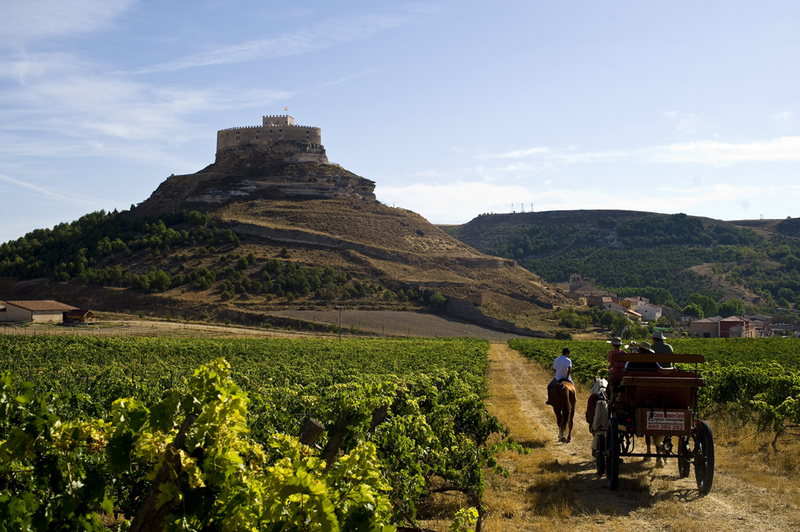 Those grapes get grown all the way down the valley, all the way into Spain, here called the Duero…which is what we’re going to have a quick chat about. Over in Spain they get processed in the normal way of wine, producing some of the biggest reds in Spain, with all the deep fruit and spiciness you’d expect from the valley. Tempranillo works so well because it’s roasting hot during the day, but the vines are planted up high in the valleys, meaning it’s relatively cold at night. So ripening is rarely a problem, so you get great fruit flavours. Tempranillo, along with other grapes in a similar vein, produce slightly more colour pigments in their skins, so naturally you get darker wine too. This is the style that wine makers are going for. We spoke last time that Navarre are trying to copy the Rioja style. Well rather cleverly, in my view anyway, the Ribero Del Duero producers are looking to make the distinction. So heavier, fuller, younger drinking wines. So good with those beef pintxos we were eating a couple of weeks back. The other very important thing from the drinkers’ point of view is that these wines, from a marketing point of view, are still playing second fiddle to the more famous wines from Spain. That means the value for money on offer is right up there with the best in the country. Gorgeous looking place, but not great if you’re not sure if you’ve left the gas on and need to go back and check! Up in the northern hemisphere, we’re heading into winter. The first snows are hitting the UK this week apparently (cue mass confusion and closed airports!). Not a bad time to have a few bottles of Duero reds in the cellar. See you through til spring.